💥Ever wonder how we get fat? 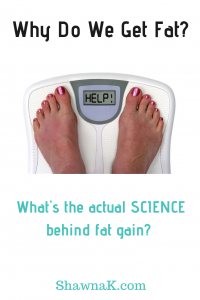 BUT, there’s actually a simple metabolic process that causes us to store fat that’s pretty much the same for everyone [stick with me]. 1️⃣High blood glucose elicits the release of the hormone insulin. 2️⃣This speeds the uptake of glucose by tissues and favors the storage of fuels as glycogen and triaglycerols. 3️⃣This storage process inhibits fatty acid mobilization in adipose tissue. 🛑WAIT – What does this really mean? 📌High blood glucose comes from eating carbohydrates. ✳️Let me be clear: Carbs are NOT bad 😈 [too many carbs are not good]…👉🏻We need carbohydrates for brain function and many other metabolic processes….👉🏻Don’t even get me started on eliminating all carbs (as in the keto diet) 😡. 📌When we eat ANY type of carbs, this prompts the secretion of insulin so your body can do something with the energy that you just ingested. ✳️NOTE: Insulin is NOT bad, it’s just a delivery vehicle [too much insulin is not good]. 📌Insulin will deliver energy where you need it. ✔️If you’re exercising, energy will be used immediately. ✔️If your liver or muscles need energy replenished, it will go there. ✔️If energy is not needed for immediate use, nor for liver or muscle stores, then it’s saved in the form of body FAT. ✳️NOTE: We often have a surplus of energy. ❌We may be sedentary with low energy requirements. ❌So the body shuttles extra energy into fat stores and we NEVER mobilize the fat we’ve previously stored. ❌So as long as insulin stays elevated, it will inhibit the release of stored body fat. So ⬆️increased insulin levels will prompt storage of unused energy as fat. ❌Eventually you become insulin resistant which means that now your insulin levels remain abnormally elevated. ❌So now your fat tissue tends to work towards storage rather than mobilization and you get fatter 😫.